Welcome to 20XXTE! Before we get into detail about the main features, here is an overview of some general new features that you'll enjoy. ​You can change your menu music by going to Sound Test and simply playing any song. Your choice gets saved to the memory card. Rumble settings can be changed on the Character Select screen - press D-pad up/down to turn rumble on/off. If rumble is enabled, you will feel a rumble when you select your character to let you know that it's on. The rumble setting on nametags is no longer used - only controller settings matter. Handicap is now used to set a custom stock count for each player. It's useful for crew battles, or simply for evening out a skill disparity in friendlies. You can now enter longer names into the Name Entry screen. You can also press X to toggle uppercase/lowercase characters. On the Stage Select screen, only stages enabled in the Random Stages list are shown. To show the entire stage list, press Z. For tournaments, you can strike stages by pressing X. If the Random Stages list needs to be set, try pressing X or Y on the Random Stages screen to load stage presets for singles or doubles. Starting a 1-minute Time Match now provides a special Hand-Warmer mode. During hand-warmers, players cannot hit each other, and they can even grab the same ledge. Also, even if pause is disabled, players may pause and quit out of hand-warmers. After the match ends, settings are automatically set back to 4-stock. 20XXTE is free to copy and distribute. You can help out your local scene by offering to copy 20XXTE at events. 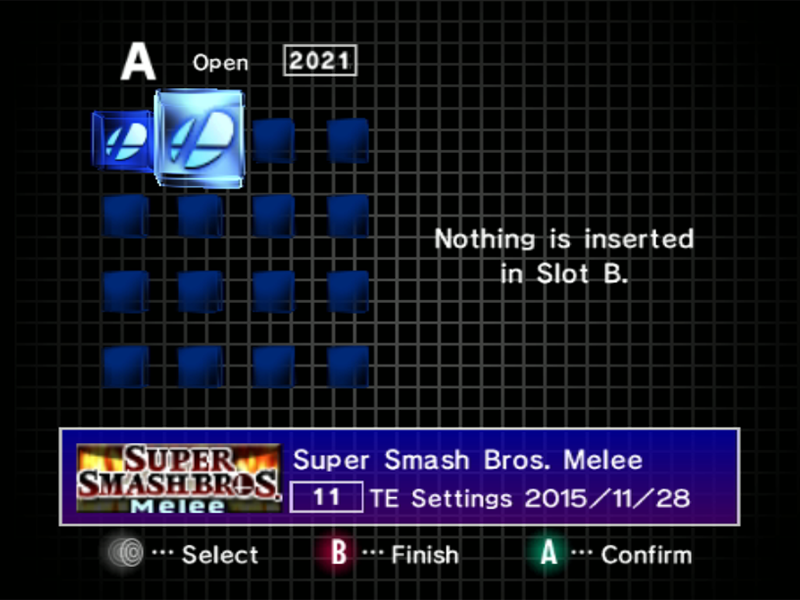 The easiest way to copy 20XXTE is to use the "Copy 20XXTE" button in the 20XX Menu (info in the next section). Using this, you can insert any memory card in Slot B and press Start to quickly copy 20XXTE. After you first load 20XXTE, you'll notice a new file on your memory card called "TE Settings". The TE Settings file is the one that 20XXTE uses to save your data. In other words, the red "Game Data" file is used to load 20XXTE, and the "TE Settings" file is used as the game's save file from that point on. If you want to copy 20XXTE from the System Menu, you only need to copy the "Game Data" file. 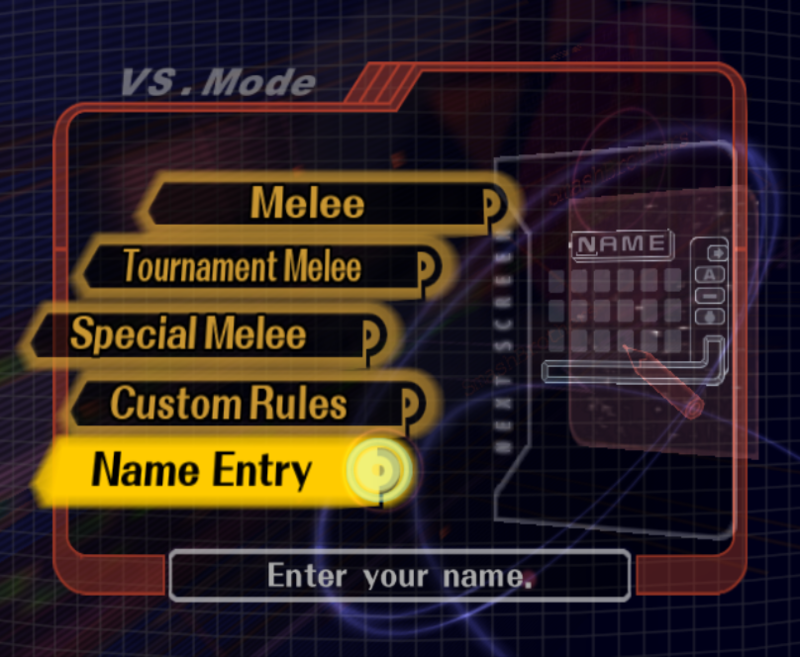 To access the 20XX Menu, go to VS Mode > Tournament Melee. A brand new menu will appear where you can access many of the great features 20XXTE has to offer! You can also access this menu from anywhere by pressing the Reset button on your console. * TOs: To lock your settings during a tournament, remove your memory card and then press the Reset button. The 20XX Menu will no longer be accessible until the console is powered off. If a tournament is in progress, then Tournament Mode should be ON. This will disable all of the aesthetic or mechanics changes that can disrupt tournament sets. * If you don't enable Tournament Mode, then the READY TO FIGHT banner will be green instead of yellow. This tells you that the setup is running with customizations. 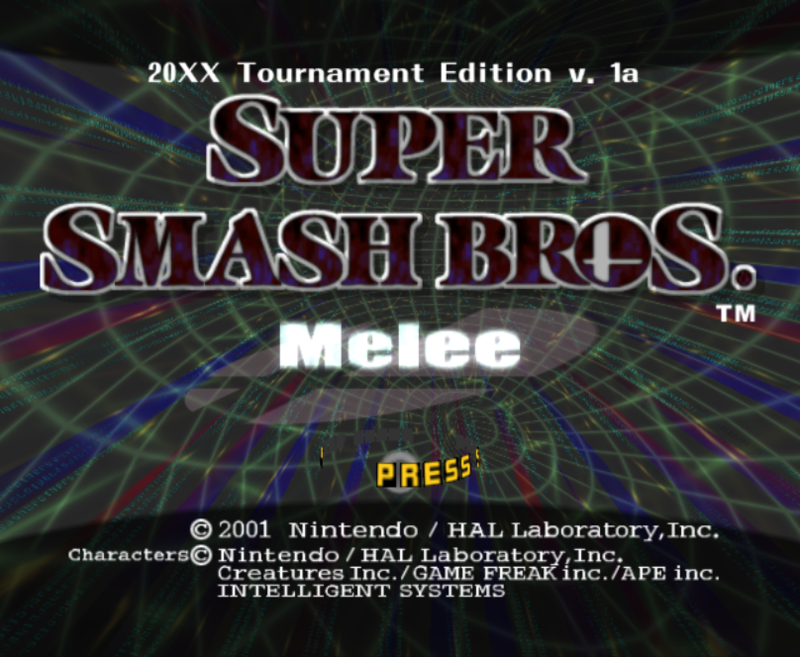 Enables 16:9 widescreen support for Melee. This may be used with LCD displays. The aspect ratio takes the horizontal underscan into account (black bars at the sides of the screen), so leave those there for an accurate aspect ratio (or crop them away for stream layouts - just don't stretch the image). 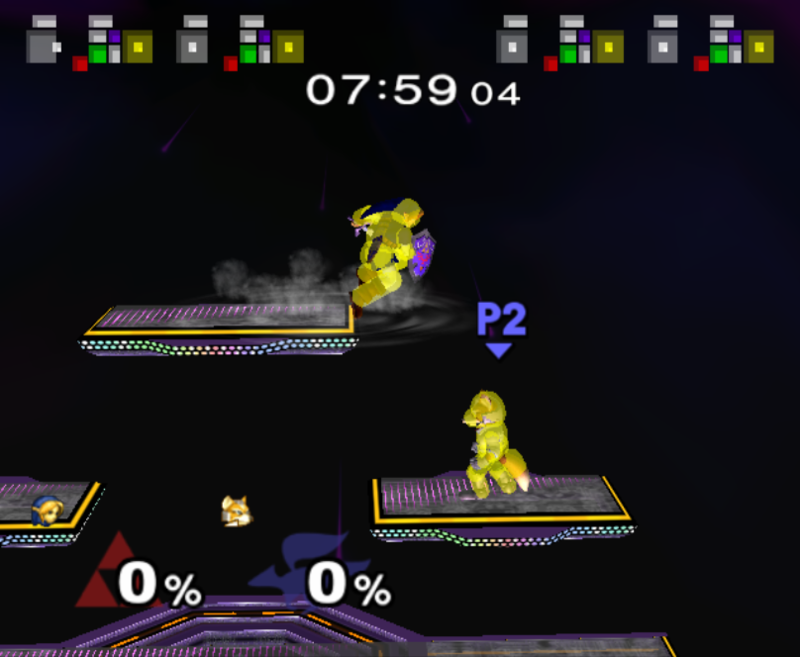 ​In Melee, players spawn in different locations on the stage based on the controller port they are plugged into. However, tournament rules have a list of recommended ports for each player to fairly start the match. When you enable Neutral Spawn Points, the players will automatically spawn in the recommended starting positions, regardless of the port they are plugged into. Yoshi's Story: Shy Guys are removed. Dreamland 64: Wind is removed. Pokemon Stadium: Transformations are removed. The neutral transformation will be present the entire match. Final Destination: Background transitions are removed. The "outer space" background will be present the entire match. Kongo Jungle 64: The Barrel Cannon under the stage is removed. If this is enabled, a match can only be paused by holding Start for a short period of time. This helps prevent players from accidentally pausing the game. The instruments used in the music on Dreamland 64 cause the audio to carry much farther than other music in the game, which makes tournament venues noisier. Enable Lower Dream Land BGM to slightly reduce the volume of the music on that stage. The features in this menu are only available when Tournament Mode is OFF. These should only be used at home, or after the tournament has concluded. After a match ends or is quit, you are taken directly to the Character Select screen. Whenever you begin a match, a random song is selected and used instead of that stage's default song. Certain actions, such as hitting your opponent with a powerful attack, causes the screen to shake. Using Disable Screen Rumble will prevent this shake effect. When enabled, you can press L or R on the Character Select screen to cycle through 18 different shield colors. Your character portrait background color will change to show you your shield color. You can enable a flashing effect to occur when you complete or fail an L-cancel. "Flash Successful" will cause you to flash white when you complete an L-cancel. "Flash Unsuccessful" will cause you to flash red if you miss an L-cancel. "No Flash" disables this setting. Normally, when a match ends and the "GAME!" graphic is displayed, the match freezes in place for a second before the Results screen is displayed. By enabling this option, you can still move around for that one second after the match ends. The "GAME!" graphic is reduced in size as well. If you are KOed during this period of time, there will be no effect on score. This allows you to enable any character slot as human, even if a controller isn't plugged in. When this is enabled, you can hold A+B at the end of a match to restart the match. This also works when quitting a match by holding L+R+A+B+Start. Taunt Canceling is a feature in Smash 64 that allows you to cancel your taunt by sliding toward the edge of a platform while taunting. Enabling this feature allows you to do the same in Melee. When enabled, players who are KOed upwards will no longer fly into the background and turn into a star. Instead, the KO animation will be the same as any other, with an instantaneous death plume. This can help speed up matches by reducing waiting time between stocks. When this is enabled, L-cancels are automatically completed, even if you miss the input. However, if you successfully perform the input, your character will flash white. This is great for new players who are still inconsistent at L-cancelling. It allows them to still practice the proper input, but also begin to learn the proper timing for pressure and combos. Enabling this gives all players infinite shields that do not decay. Also, if this is on, CPUs will always hold shield. Enabling this sets the camera to "Fixed Camera Mode", where the entire stage is displayed and the camera does not move. When this is enabled, you can press D-pad Right to display collision bubbles (hitboxes) during a match. ​When this is enabled, an input display is shown at the top of the screen. This is great for livestreams and tutorial videos. ​When this is enabled, CPUs will DI and tech randomly. The tech proportions are: 50% tech in place, 40% tech roll, 10% no tech. If you use a powerful attack against a CPU, they will use the optimal survival DI to survive the attack. ​When this is enabled, your character will turn green while standing still or jumping. You can use this to observe where your movement or pressure is slow, with the goal of seeing as little green as possible. 20XXTE allows you to save replays of your matches. Whenever you play a match, it is automatically recorded in the background and can be played back or saved to the memory card. Press Z on the Character Select screen to access the Replay menu. From here, you can play back the match you last played, or you can save it to the memory card. You can safely insert and remove memory cards while in this menu in case you want to use a different card. First, set the ID you want for your replay file. You can choose up to two letters and a number. This naming scheme was chosen because most tournament bracket software assigns letter IDs to bracket matches, so TOs can name replays according to the bracket ID. After you set your ID, press "Save Replay". Saving a replay may take a long time depending on the length of the match, so please be patient until you receive the "Done" message. If there are other issues, such as the memory card being full or a replay of that filename already existing, you will be told. You can use "Load Replay" and "Delete Replay" to load or delete replays of the specified ID. 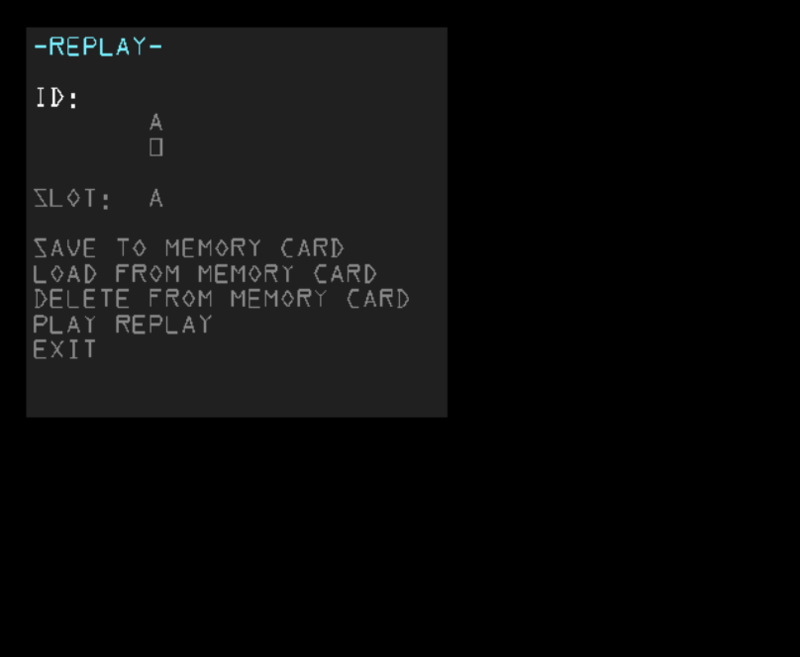 Loading a replay puts it into game memory, so you can then play it back or save it to a different memory card. When playing back a replay, you are given a variety of controls. Start: Pause the replay. While paused, you can press Z to advance frame by frame. L/R: Slow down or speed up the playback speed. A: Toggle the visibility of collision bubbles/hitboxes. Y: Toggle the visibility of an input display at the top of the screen. X: Perform a normal game pause, allowing you to move the camera or quit the replay. D-pad Down: Cancel playback and give control back to the players. Doing this will not affect the replay that is currently in game memory - it is not recorded. 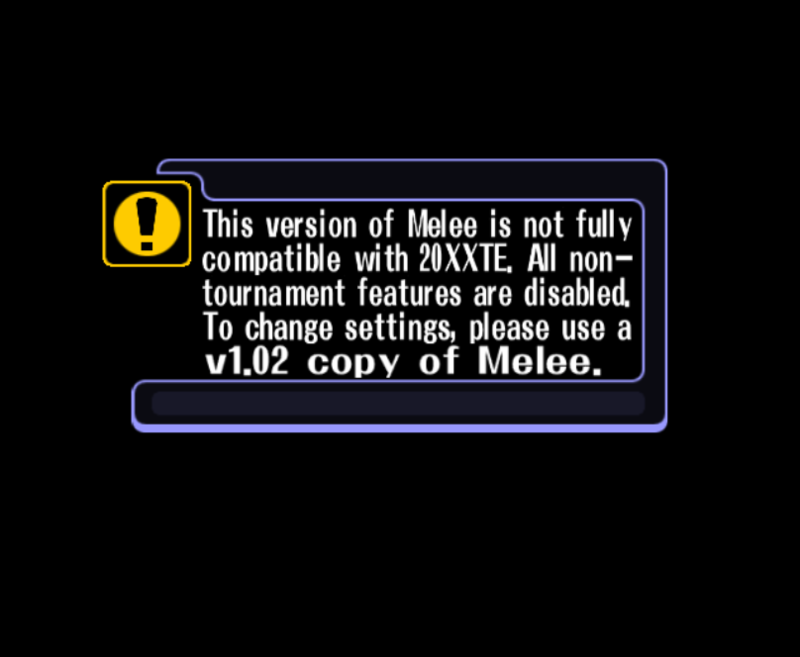 20XXTE offers limited compatibility for v1.00 and v1.01 of Melee. This allows you to load 20XXTE on every tournament setup without having to worry about the version of the game. However, v1.00 and v1.01 have a limited feature set - only tournament-related features will be available.